Yesterday, I went to an old friend’s house to play board games and visit for a while. The conversation turned to games we had been playing lately, and I mentioned that I had just played the new D&D board game, The Legend of Drizzt. After I shared my thoughts on it with him (short version: it’s awesome), I opined that they should make a Dragonlance D&D system game next. My friend disagreed, and said Dark Sun is the better choice. This awakened many of my memories from almost twenty years ago. The summer of 1992, right after I graduated high school, was one of the best of my life. It was really the last time that many of my circle of friends would have a significant amount of time with one another. For that summer, we had a great situation: several creative, intelligent D&D fans with lots of imagination and free time on their hands. For a couple months, we had near-daily sessions of gaming, most all of them set in the blasted lands of Athas. 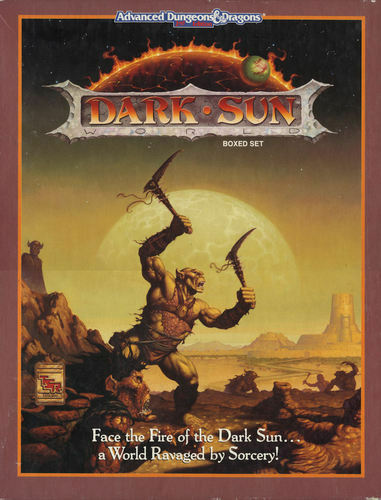 Dark Sun was the hot new campaign setting of the time. It was so different from what had come before, totally unique, that we found it totally intriguing. The older, popular worlds of Greyhawk, Dragonlance, and the Forgotten Realms may have had some minor differences from one another, but they all shared the standard basic fantasy elements like grey-bearded wizards, stodgy dwarves, and knights in shining armor. Dark Sun totally turned the standards upside down, in many different ways, from the races to the monsters to the brutal desert setting. There were no grumpy, bearded dwarves on Athas, nor were there green-clad forest-loving elves (since there were no forests). Kind-eyed, Hobbit-like halflings smoking pipes were replaced by a savage, minuscule race of deadly cannibals. Some races in Dark Sun were more at home in the Monster Manual, like the half-giant, thri-kreen, and aarakocra. Even the classes were wildly different. While there were still fighters and thieves, magic-using classes were significantly changed. Arcane magic came in two flavors, defiling, a quick and dirty method which drained the life force of plants and animals nearby, or preserving, which was more difficult to use yet avoided damage to the environment. The populace feared all defilers and preservers, since misuse of magic was what had changed Athas into a hot, dreary wasteland. Divine magic was non-existent; priests instead drew power from the elements, including the hybrid elements of sun, silt, rain, and magma. The templar class, servants of the Sorcerer Kings, also had cleric-like powers drawn from their masters. Removing the gods themselves from Athas was a bold move that added to the unique nature of the setting. Perhaps the most appealing part of Dark Sun was the increased power level of the characters. I am a min-maxer at heart, and there were ample opportunities for making optomized characters on Athas. Due to the harsh conditions, the races had all evolved into sturdier, stronger versions of their Player’s Handbook selves. Ability scores ranged much higher than the standard cap of 18, so most Athasians were like superheroes compared to normal D&D characters. Topping it all off was the psionic ability common to the setting, allowing interesting powers and abilities to all classes and races. It was a power gamer’s dream, and we loved every minute of it. I would be remiss if I did not mention the incredible art and design work of the Dark Sun setting. The detailed, visceral work of Brom adorned the cover of most Dark Sun products, and it perfectly captured the savage, alien feel of this wasted world. I wonder if Dark Sun would’ve made such an impression on me if another, more traditional fantasy artist had been featured. Dark Sun adventures were quite different than the standard 32-page stapled module, including two small spiral bound books, one each for players and DMs. Again, it felt different and new compared to the previous products released by TSR. 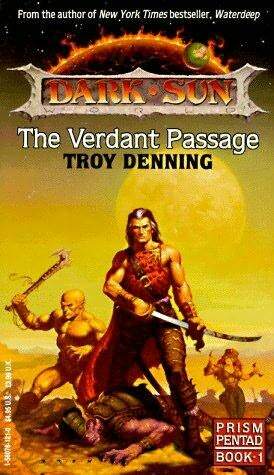 As was the case with most campaign settings, there was a set of novels released for Dark Sun. The Prism Pentad was a series of five books detailing the world and its major characters. The Rome-inspired city-state of Tyr was detailed, with its gladiatorial area, scheming nobles, and many different layers of intrigue. It was an excellent introduction to Dark Sun, and surely added much to our enjoyment of playing D&D in the world of Athas. Computer games set in the Dark Sun world were among the best available at the time. They boasted excellent, full screen graphics, with a turn based combat system very similar to the tabletop rule set. The first game, Shattered Lands, was followed by a sequel, Wake of the Ravager, in which you actually fight the tarrasque. Yes, that tarrasque. It’s one of my favorite boss battles in any video game I’ve ever played. After I started playing D&D again earlier this year, I was thrilled to see that Dark Sun had been released for the 4th edition version of the game. I’ve not had the chance to DM a game set in Athas as of yet, but it’s something I’d love to do someday. Dark Sun twisted the fantasy genre in many different directions, altering it and adding to it in a way that made for what I consider to be the most unique campaign setting ever released for D&D. This entry was posted in D&D, DM Advice, Dungeons & Dragons, Roleplaying and tagged D&Development, Dark Sun. Bookmark the permalink. Glad to have you back! There is a really good community on the WotC forums. We also have a story-driven Dark Sun organized play campaign called Ashes of Athas (for which I am an admin). Adventures premiere at DDXP, Origins, and Gen Con. We also release them for free for home play during brief windows (Chapter 2 can be ordered now and through December 15th). My WotC blog may be of help in running an Athasian campaign. Finally, DDI has released a lot of additional Dark Sun content – I highly recommend it.